1. There are an estimated 50,000 leopards living in the world today. 2. 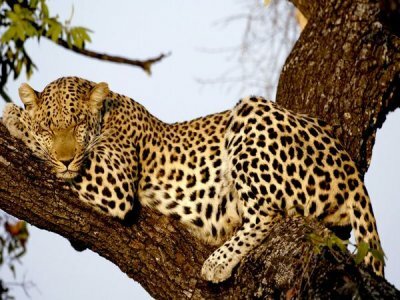 The leopard will hunt about 90 different animal species, including reptiles, birds, fish, amphibians, wild pigs, rodents, monkeys and hoofed mammals. 3. Leopards can live in a wide variety of climates and environments. They have been found thriving in areas like the jungles in India to the desert mountains of Afghanistan. They can also be found in Asia, Russia, Korea, China and Malaysia, among other places. 4. Adult male leopards can weigh as much as 200 pounds oras little as 82 pounds. Adult females typically weigh between 62 and 100 pounds. 5. Since they are mostly nocturnal animals, leopards can be found stalking their prey mostly at night. However, they have also been seen stalking prey on overcast days. 6. Leopards are great climbers and they will often stalk their prey from high branches on a tree. They can pounce from a tree branch and they generally store their kills up high in sturdy tree boughs to keep it away from other animals. 7. When a leopard is not hunting for prey, it flips its tail over its back. This reveals the leopard’s white underside which is an indication to other animals that it is not in hunting mode at the time. 8. Leopards are solitary animals – they do not tend to spend time with other and they will generally go out of their way to avoid each other. The only time leopards will tolerate an intrusion in their own space is when they are going to mate. 9. When a leopard is angry, they will growl loudly and spit. When they are happy and content, they will purr, much like a housecat. 10. Leopards will mark their territory in two ways – they will urinate on an area to mark it with their scent and they will also leave claw marks on trees so other leopards know that the territory has already been taken so they know to stay away. 11. Female leopards give birth to litters of 2 or 3 leopard cubs. At first, the cubs have gray fur before it develops into the spotted fur that makes leopards so recognizable. 12. The main predator of leopards is man. They hunt leopards for their fur, which is used for ceremonial coats and robes. In other parts of the world, other parts of the leopard are also wanted, such as their claws and tails. 13. In captivity, leopards can live to be as old as 21 years old. In the wild, they typically live between 12 and 15 years. 14. A leopard’s markings are much like the fingerprints on humans. There are no two patterns that are alike and they can be used to differentiate between each other. 15. A leopard generally becomes self-sufficient at the age of about 22 months old. The mother, however, may continue to assist the offspring for a short time afterwards to make sure they are completely self-sufficient. 16. When a female leopard is in heat, she attracts male leopards due to the scent of her urine. When two leopards mate, they may be together for several days as they will generally mate several times. 17. A leopard’s gestation period lasts for about 90 to 105 days. 18. A baby leopard’s eyes stay closed for about a week after it is born. They will not leave their hiding area until they are between 6 and 8 weeks old. By this time, they can climb trees. 19. Leopards are so strong that they can kill prey that weighs 10 times more than their own body weight. 20. Leopards can leap distances of 20 feet. They are quite agile and they are also great swimmers. 21. Of all the big cats (lions, tigers, jaguars), the leopard is the smallest. 22. The rarest species of leopard is the Amur Leopard, which is in Russia. There are believed to be only about 30 of this species living in the wild today. 23. Leopards do not need to drink water very often. Most of the moisture they need they can get from their prey. 24. The story How the Leopard Got Its Spotsis Rudyard Kipling’s fictional account for how the leopard has such an attractive and unique coat. 25. While the leopard in general is not considered endangered, some of the species (mostly the ones outside of Africa) are endangered, including the Sri Lanka leopard, the Arabian leopard and others.